Mark Cavendish was angry and disappointed with himself and his team mates after finishing fourth in the sprint in Sacramento. He was convinced he could have won the sptint but the High Road strategy derailed on the final corner. After feeling ill during the rain-soaked stage, Cavendish offered to lead out team mate Gerald Ciolek but then the German lost Cav?s wheel on the final corner and decided to let a gap go. Cavendish thought he was leading out his team mate but then made the mistake of sitting up when Ciolek did not come past. 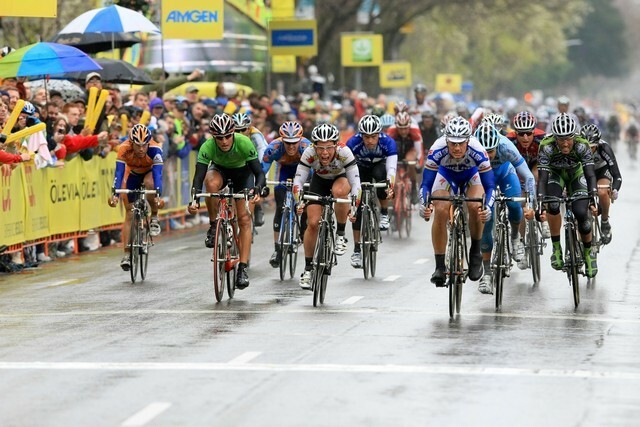 He tried to accelerate again to win the stage but was just beaten by Tom Boonen at the line. “I just didn?t know what happened, I just didn?t know,? he told Cycling Weekly after the finish. ?George (Hincapie) took us through to the last corner at about 800 metres to go. Then Quick Step?s Kevin Hulsmans went and I jumped straight on his wheel but when he saw me he swing over and bang, I was on the front with 700 metres to go.? ?I was leading Gerald (Ciolek) out but he saw that I?d got a massive gap and so sat up to let me go but I didn?t know it. With it being wet the tape holding my radio in my ear came off and so I didn?t hear anyone shout to go for it.? ?I went hard but hard cruise and then went again until about 150 to go, thinking Gerald was behind me. I looked around but nobody was there. Unfortunately, once you?ve lost the speed you can?t get it up again.? ?I think if hadn?t looked round I would have won it, without a doubt. I lost a lot of speed but they only caught me on the line and I got fourth.? ?With hindsight it?s easy to say that I shouldn?t have looked round but this is the first real time I?ve lead out a big sprint. Hindsight is a beautiful thing but I messed it up in the heat of the moment. ?